, and that the human body is masterfully built for the act of long-distance running. The question is, if we're so well adapted to the activity, why do most people injured doing it? Pulled hamstrings, plantar fasciitis, knee pain, Achilles tendinitis - it's a massacre out there. Among runners, injury is not the exception, but almost always the rule. Our civilization has thrown a massive arsenal of technological innovations at our common running injuries, but they've only become more prevalent. We've got $200 running shoes controlled by computer chips, magazines and scientific journals filled with countless studies on the best ways to run, and coaches, therapists and podiatrists eager to tackle our problems, yet we're still getting mowed down. Studies variably claim that every year -yes, every year- between 40 and 80 percent of runners get injured. Even believing the lower figure, that's still a ridiculously high rate. So what's wrong with us? How can we be so biologically fit to run and so injury prone at the same time? How did we get into this situation? You're buying things you don't need to fix a problem you don't have. The idea that your feet, Achilles tendons , and knees are all horribly defective, or were never intended to run in the first place, is the lie you've been spending your money on. Adidas, Nike, and New Balance would love for you to keep buying it. A lot of foot and knee injuries that are currently plaguing us are actually caused by people running with shoes that actually make our feet weak, cause us to over-pronate, give us knee problems. Until 1972, when the modern athletic shoe was invented by Nike, people ran in very thin-soled shoes, had strong feet, and had much lower incidence of knee injuries. The idea that nature screwed up when she got to you is completely counter intuitive, but we invariably believe it. Except for the minority who truly have deformed appendages, the feet, knees, and every other part of our bodies are just fine. Sure, some are born with parts ideal for running, but almost everyone comes ready-made for truly impressive feats of foot. You were born to run, and the sooner you get that through your head, the sooner you'll stop believing nonsense and start avoiding common running injuries. 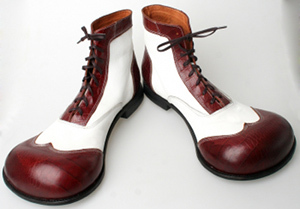 For many years, the only evidence we had of the shoe companies' fraud was history and a few brave examples. We know full well that the ancient Greek Olympians ran barefoot or in sandals just fine without our common running injuries, and that for much of human history, we wore minimalist footwear or went barefoot. We've had a few odd examples more recently, like Abebe Bikila, yet almost no one in the mainstream has made a serious argument against shoes that I'm aware of. A study on the barefoot and shod populations in Haiti showed that injuries to the lower body are much higher in those groups that wear shoes. Running-related chronic injuries to bone and connective tissue in the legs are almost unheard of in developing countries, where most people are habitually barefoot, Got plantar fasciitis? Barefoot populations don't (1). Wearing shoes makes you a less economical runner. The heavier the shoes and orthodics, the more oxygen needed to run in them. One study found that adding shoes and orthodics representing 1 percent of body mass increased oxygen consumption by 3.1 percent (2), another, comparing running at 12 km/h in bare feet vs shoes, found that the shoes increased oxygen consumption by 4.7 percent (3). Shoes compromise the ability of the legs and feet to act as springs. In bare feet, your legs return 70 percent of the energy stored in them, but if you put on running shoes, that return is reduced considerably (4). When running barefoot on solid ground, we compensate for our lack of cushioning by plantar-flexing the foot on contact, creating a softer landing (5). Because barefoot runners can't land on our heels without pain, we land mid-foot, creating more work for the the soft tissue support structures, and thereby increasing strength and possibly reducing the risk of injury (4). There is not a single study showing that shoes reduce shock when you run, and several showing that they do not (6). One study noted that shock to the hip joint was lower for barefoot jogging than for jogging in several types of shoes (7). The more expensive the running shoe, and the more packed with injury-prevention and anti-pronation gear it is, the more likely you are to get injured in it. Cheap shoes cause fewer injuries than expensive ones (8). This is just a modest sample, and more studies are coming out all the time. Despite their massive budgets, shoe companies have been unable to muster studies showing their shoes prevent common running injuries, or serve any purpose at all. Nike has even come out with its Nike Free line, which is an attempt to sell barefooting to the public through shoes. Pronation is not bad. Being flatfooted does not mean you must consign yourself to shoes. You feet work fine, so use them. Read about barefoot and minimalist running practices that can prevent common running injuries. Read about a sensible way to transition toward barefoot and minimalist running here. Learn about a healthy raw food diet that will boost your health and athletic persuits to a new level. Find out how diet may have influenced our running abilities.